Few things captivate the mind quite like monsters. From the time we are little children until we are adults (and even beyond), monsters are a huge part of our lives. Everyone remembers the nameless beasts that live in our closets, or under our beds, waiting for us to fall asleep before they can pounce. The very notion of fear of the dark speaks to our heritage as part of the animal kingdom- predators who hunt by night, the fear found with confronting the unknown, the whispers we think we hear when shadows fall. Being scared, and the creatures that do the scaring, are a big part of our shared culture, and often reflect the world we live in. As this is October, the unofficial scariest month of the year and home to Halloween, I’ve decided spend some time looking at monsters, ghosts and things that go bump in the night. Specifically, I plan to take this next month (or two) to look into the phenomenon of yokai in Japanese culture. Now, there has been a lot written about yokai, from both an academic and cultural perspective. They appear on screen, television, in games and the written word. And they reflect a lot of the little subtleties of Japanese culture. Like a lot of Western monsters, yokai have their roots in the unknown, and as warnings of what we should or should not be doing. But unlike a lot of Western monsters, they have influenced a lot of the Japanese way of life, though superstition, urban legendry, and cautionary tales. Today, I’d like to go over some of the basic concepts found within yokai culture. Then, I plan to explore some of the traits that are widespread within the monsters as a whole. Soon afterwards, I will begin to post various profiles of yokai both past and present, and point to how they hold influence over superstition and other parts of Japanese culture. Finally, I will close out the month(s) with a few ruminations over some prominent anime and games that utilize yokai as a storytelling tool, and how this reflects the source legends. As a whole, yokai are as big a part of Japan as anything else. While a lot of cultures have their own monsters, few have as developed or far-reaching as Japan. Explaining the impact of yokai on Japan requires more space than I have to work with, but I would like to focus on a few of the key points made by Michael Dylan Foster in his remarkable treatise on the subject, “Pandemonium and Parade.” For those interested in learning more, that book is highly recommended. One of the first things that must be pointed out when discussing the idea of yokai is that the word itself doesn’t have a precise meaning. While loosely translated as “monster,” the word actually has about a dozen other connotations attached to it, including spirit, goblin, ghost, fantastic being, strange experience and, possibly the most telling, changing thing. This idea that yokai are mutable/transformative in some way, and are linked in with changing forms and ideas, is central to both the powers ascribed to some of the monsters, and the method by which they have survived long past other folk creatures worldwide. Yokai in Japan have been around seemingly forever. Some of the oldest such monsters have their roots in Heian period Japan, a time when the nation was going through a good deal of upheaval. At the time, monsters were very regional in nature, and often tied to either natural phenomena, or to specific moral/social ideas, loyalty and duty being major points of impact. Yokai were either seen as being a strange, unknowable part of the landscape, coexisting with humans despite being on the fringes, or as the end result of neglectful behavior or improper action. The former type were often accepted, while the latter were feared, due to their origins and often supernatural natures, and powers. Indeed, this idea of natural vs Supernatural is still a common thread in yokai culture, especially given the preoccupation with disciplines like metaphysics and cryptozoology that our modern world has created, trying to make empirical sense out of decidedly non-empirical belief. In the Edo period, the fascination with yokai began to gain steam. Originally regional monsters began to be formally catalogued by the Edo government, and scholars and storytellers were encouraged to travel to Edo to present tales and information about the otherworldly begins living in their own provinces. Often called the “Great Cataloguing,” it was a time when yokai were being shared with the nation of Japan as a whole. Also during this time, many new yokai began to appear, as tales spread. This period of yokai fascination culminated with the publishing of art prints by Toriyama Sekien in the 18th century. Sekien, an artist who specialized in ukiyo-e style woodcuts, would become famous for his images, which depicted most, if not all, of the yokai presented in the infamous hyakkiyagyou-emaki, or Night Procession of 100 Demons. 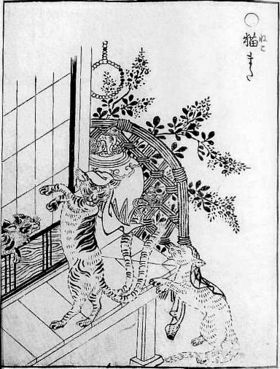 Even into the modern world, Sekien’s illustrations often serve as the inspiration for modern artist seeking to draw yokai for their own projects. Fast forward a hundred years, and a massive change in Japanese politics and policy brought a new variable into the fold. In 1868, the Meiji Restoration both brought Japan into the modern world, and gave Western scientists and thinkers access to previously restricted information. Not surprisingly, this interest extended to the “quaint” belief in yokai, and Western science began to look into the claims surrounding them. As previously mentioned, cryptozoology in its earliest forms began to explore previously held beliefs that monsters existed, and the discussion began. West and East collided as cultures mixed and monsters made the transition across the vast oceans. This “diaspora of the scary” came to a head in 1904, when European scholar, and staunch Japanophile, Lafcadio Hearn published “Kwaidan,” acknowledged as the first book of Japanese ghost stories and monster culture to be published outside of Japan. Hearn, himself interested in the supernatural dimensions of the world, phrased these classic stories in words that Westerners would both understand and appreciate, and helped usher in the third period of yokai fascination. A scant 20 years after making their debut, yokai had transformed from Japanese import to cultural ambassador. Much like anime did in the 1990s and beyond, the Western world became fascinated with these monsters, far beyond the purely scientific, and the tales began to become common in social circles. The yokai themselves began to illustrate and represent Japanese culture in ways that ceremony and circumstance could not- the West loved scary things, and these were an entirely new form of scary. Often born our of different cultural norms, they incited the senses and the mind, and helped explain some of the eccentricities of Japanese culture at a time when Japan was exploding as a world power. Hearn himself hoped the same, writing that as his book was being published, Japan and Russia were already amassing forces, and he hoped that these tales would allow for those not taking part in the battle to see a different side of Japan (see Kwaidan "Introduction") than simple military successes or failures. Then came the war, and yokai transformed yet again. Similar to the ways in which they served as cultural ambassadors at the start of the century, towards the end of it they once more took on this role, but this time, instead of bringing Japan to the world, they helped Japan re-establish its identity. Following the war, when films and media were outright banned from showing movies glorifying the military past of Japan (in particular, the samurai and all they were linked to), yokai began to become the new way of showing who the Japanese were. From the 1950s onward, Japanese ghost stories became popular films and were embraced by audiences around the world. But within Japan, their meaning was more than just insight and entertainment- they were Japan’s own, a product of her borders and native to her lands. And, as before, they were still transforming, and new creations emerging all the time. Some were reinterpretation of older tales (Kuchisaki-onna, the Slit Mouth woman), some were born out of the climate of war (toire no Hanako, the lonely ghost girl), but all of them had one major thing in common: they existed only in Japan. Unlike European monsters, who had received a diaspora like no other and were being claimed by dozens of nations and cultures, yokai were still Japanese, and only Japanese. This fascination with the idea of yokai continues in the realms of anime and manga, as it did with film, television and books for so long. The artistic representation of the unseen ranks of Japan’s supernatural have always held strong appeal, and that has not changed one bit since the Edo period brought yokai into the spotlight. With generations of people in a newly globalized world, this is the next step in the star of yokaidom, and the introduction to a new audience, much like Kwaidan did over a century ago.